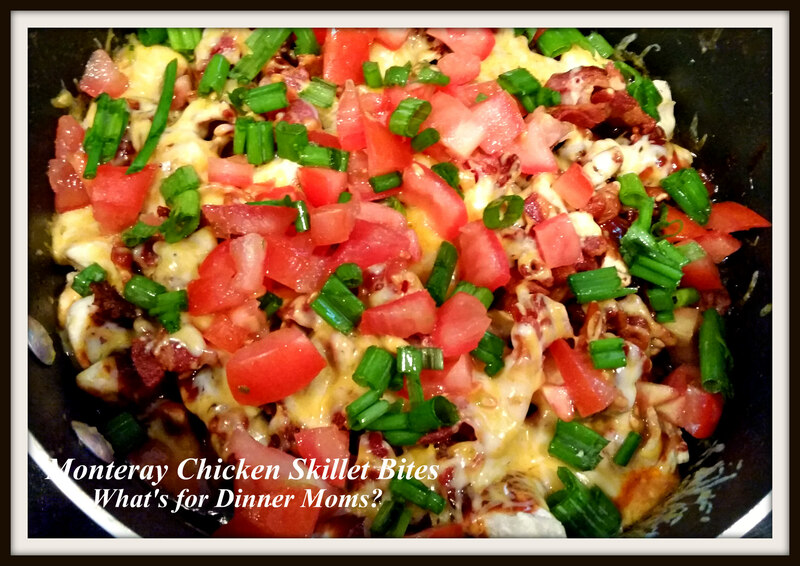 Monterey Chicken Skillet Bites – What's for Dinner Moms? I am always looking for simple dinner ideas. Now, I am a bit picky about my simple dinners. I prefer they not have canned soups, packaged spice mixes and can be made with minimal pans and dishes. I do make exceptions for each of these on occasion but for the most part I try stick to those three things. This recipe was a bit of a happy accident as I thought I had chicken tenders thawing in the ridge but it was cubed chicken breast. I thought about changing my plans for dinner but forged ahead to see what would happen to this dish with cubed chicken instead of breasts or strips. This was one of those “happy accidents.” Because the chicken was cubed it took almost no time to cook. Then the kids preferred it because more of the chicken was coated with barbecue sauce, cheese and bacon. Usually it is just the outside of the chicken breast but this was surrounded by all the cheesy goodness. There was not a bite of this left at the end of dinner. I think the kids would have licked the pan if we had let them. I will admit I did use bottled barbecue sauce because I really like the Sweet Baby Ray’s Honey Barbecue Sauce and it made the time to make this dish even less! This dish is gluten-free so my mostly gluten-free son loved this. I served this dish with a Super Kale salad and macaroni salad on the side. This would also be delicious over mashed potatoes. In a skillet over medium-low heat cook bacon until crispy. Remove bacon from pan with a slotted spoon to a clean paper towel to drain any excess fat. Remove all but 2-3 tablespoons of bacon grease from the pan. Add chicken to skillet and cook over medium heat until just about cooked through. Mine took about 5-7 minutes, this will vary depending on the size of your chicken pieces. Remove pan from heat. If there is excess grease drain off. Pour barbecue sauce over the chicken and stir well. Sprinkle bacon over the chicken. Then top with the cheese. If you have a skillet that can go in the oven place under broiler for a minute or so until the cheese melts and starts to brown slightly. If not place a lid on the pan and return to medium-low heat for a few minutes until the cheese melts. Remove pan from heat. Sprinkle the tomatoes and green onions over the top of the dish. This will get made and destroyed in my house. Love it. You know, if worms were coated in barbecue sauce, cheese and bacon, there’s a 92% chance my kids would eat them. We had a happy accident recently in the kitchen, too. My youngest and I made oatmeal cookies, but forgot to add flour. Result: Runny cookies that broke apart and got toasted. When it cooled … we discovered it was top-notch granola. Happy accidents are the best! Thank you for commenting! yumm this sounds so good. I love your three rules, awesome! Thank you! We all have quirks about food, those are mine. Lol. Wow excellent quick and easy meal! You’re right about the cubed chicken- no time at all to cook, I never really thought of it like that. This is a great recipe!! Your blog has super recipes! Have you thought of publishing your own cookbook? 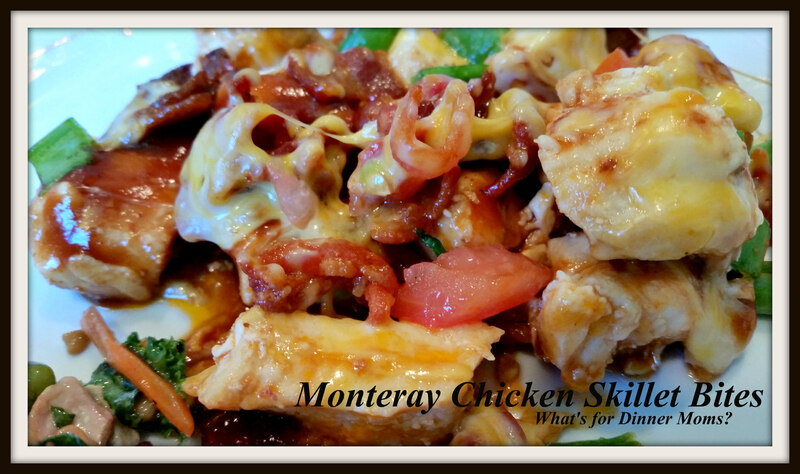 I am making this chicken for tonight! Thank you so much! You are so very sweet! Hope you like the dish.